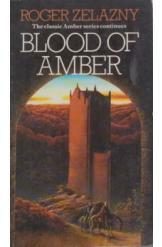 Blood of Amber by Roger Zelazny, Sci Fi. Book is in good condition, all pages intact. After escaping his imprisonment, the wizard Merle Corey - son of Corwin of Amber - returns to his homeland to find it a place of hidden betrayals and threats. Part of the Amber series.